"I Bought Milk, Eggs & Fabric Softener!" OK, I give up on waiting for you to answer. It's "Home Alone," one of three movies I know nearly every line to (the others are "Newsies" & "Men in Black." Judge if you must). Yep. 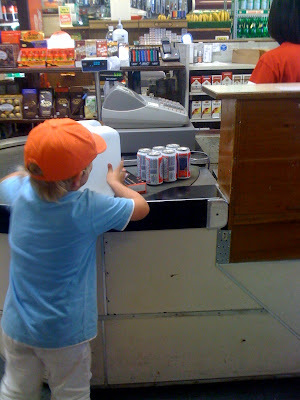 Little European kid, aged 6 or under, carrying a sixer of Miller, keepin' it classy at Dupont Circle's Metro Supermarket. No worries, of course: His dad paid &, I presume, did not consumed it with the help of his uber-underage offspring, but this scene gave the cashier & I a good laugh. When I was living in Turkey, I bought my mom cigarettes all the time...I'm pretty sure I could've bought alcohol before 18 as well. It's a neighborhood thing. If the grocer knows your parents, then they'll sell you the cigs. That is awesome and classy. Whatever. That kid was going on a bender. I'm sure of it. He had you all fooled. Dupont? I figured West Virginia. Hey, I knew that "Home Alone" quote! Um, should I be proud of that? Just watched MIB this weekend. Guess when it gets old?